Disclaimer: I received a complimentary copy of this book from Atria Books, via NetGalley in exchange for an honest review. "My name is “J” and I’m awkward—and black. Someone once told me those were the two worst things anyone could be. That someone was right. Where do I start?" 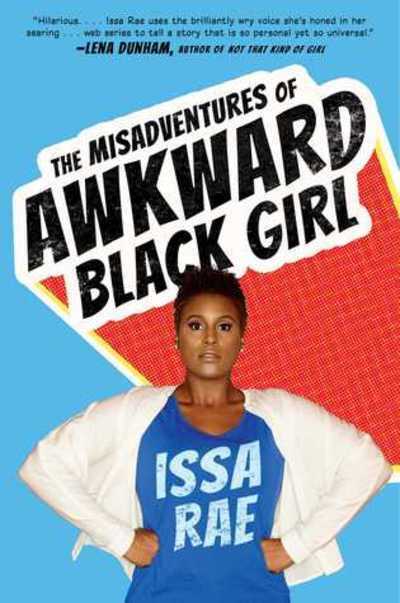 Issa Rae is the creator of the hit web series Awkward Black Girl. The show is about the trials of tribulations of J, a self proclaimed "awkward black girl" who can't dance, has a terrible job and is unlucky in love. The Misadventures of Awkward Black Girl is not about the show, except insofar as it is also about its creator's awkwardness and blackness. It's a series of essays about her life, covering topics such as public displays of affection, dancing (and the awkwardness of not being able to do it well), relationships, family, food and learning to love her natural hair. My favourite essay in the book was Leading Lady, in which Issa Rae finds she has been blocked on Twitter by a disabled, white stripper for apparently being "whorephobic" and failing to understand her oppression. Instead of dismissing the woman's comments as silly or out of proportion to her own comment, Issa Rae turns the interaction into a lesson in empathy. She recognises that the enraged Twitter user is just looking for a fair representation of people like her, something that Issa Rae and probably anybody in a minority group, could relate to. Much of this book is out of context and harder to relate to for me, a white woman from Australia (though I certainly understand the "awkward" parts) but I was interested in what she had to say and I think I learned a few things. I also laughed out loud in a few places. The Misadventures of Awkward Black Girl is by turns inspiring and hilarious. I recommend it for fans of the show, anyone interested in black culture and anyone who is just plain awkward.